Summer season has arrived and the temperature has started to hit high. The hot dry air with a lot of moisture and dust ruining the beauty of your face. Protecting yourself from heatwaves and burning temperature is something next to impossible. So here are some tricks to keep your body hydrated and defeat the summers to some extent. 1. Taking regular precaution: If you are living in an extremely hot area where temperature cross 45 degree’s. You should take the precaution of using heavy curtains to keep the heat out of your house. Use reflectors or shades at the glass window to minimize the amount of heat entering your place. 2. Avoid the Heat: Avoid going outdoor during the day time specially between 11 AM to 3 PM. If you can’t afford to stay indoor then use the proper precautions like sunscreens, hand gloves and sweat control to avoid tanning. 3. Wear comfortable clothes: In summers every outfit seems to be uncomfortable to carry after sometime. In summers, always wear light weighed and cotton clothes. Try to avoid nylon, silk, wool and leather product outfits to stay in as much comfort zone as possible. 4. Keep your body cool and hydrated: During summers try to avoid junk food and oily food. Take the light food as much as possible and add curd, lassi and juice to your diet chart as these products helps in cooling down of the body. Drink cold coffee instead of tea or hot coffee. 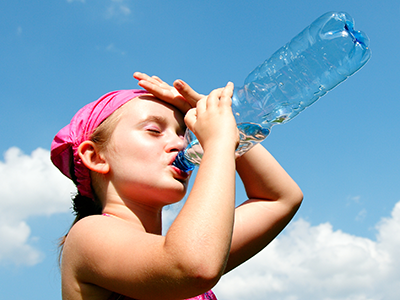 Last but not the least drink excess of water to keep your body hydrated.